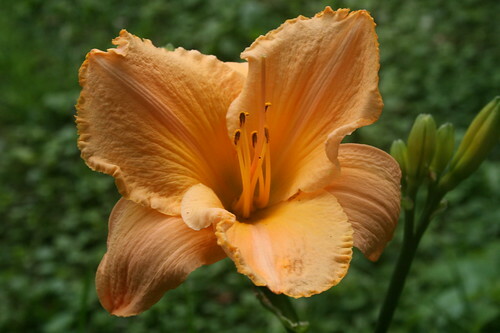 1st fancy Daylily, originally uploaded by DianthusMoon. This is aimed toward my husband and brothers who are pretty awesome fathers as is Brian’s dad and my Uncle Don (who is a step dad). My own father wasn’t, but I’d rather not think about that, but honor the fine men who love their kids and make sure they are cared for and happy. I didn’t do Photo Hunt yesterday-it was ‘6’ and I could not think of something interesting with ‘6’ in it. I could have gone through my photostream at Flickr, but that would have taken a while. Sorry Jamie! Still doing yard work. Friday I cleaned out the rose bed and Saturday morning my poor back was complaining. Saturday I got the rake out and yanked on vines growing all through my daylily bed to let them breath! Crazy weeds. My mom is coming to spend the night and then we are off to the beach. I am bringing my laptop in case it rains or something. I am meeting up with a pal from PA who will be in a nearby resort, but driving down to see me and do a little cross stitch shopping and lunch. See you soon J! We are also expecting a heat wave and have had very little rain since Wednesday a week ago. I hope I don’t come home to real droopy plants. The flowers and veggies could be so much bigger! Have a nice day Dads! Wishing your wonderful hubster a great Father’s Day, Dianne!! !